It's been two years since this, the first part of two films about notorious French gangster Jacques Mesrine, premiered at TIFF, having already made the theatrical rounds in Europe and settling on DVD in several countries. This isn't particularly surprising, as outside of French-speaking Canada audience appeal is limited mostly to art house audiences looking for something a little trashy they can justify by way of subtitles. Now, while both films are essentially one long story of Mesrine's (Vincent Cassel) criminal history, divided by his escape from the Saint-Vincent-de-Paul prison in Quebec, the distinction between them is that Killer Instinct is based partly on the book he wrote while in jail. It details his difficulties in adapting to straight-laced society after returning from the Algerian War, partaking in petty gang-related crimes while married to Sofia (Elena Anaya). Zipping through these details with little context or characterization, Jean-Francois Richet's glamorized gangster epic goes from wife-beating to bank robberies to his kidnapping of a Canadian millionaire with Jeanne Schneider (Cecile De France) in the blink of an eye, stopping only to dwell on substandard prison conditions. 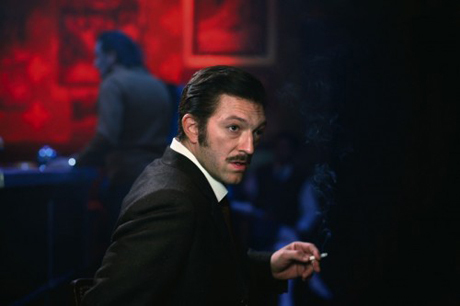 Stylistically, Mesrine is consistently engaging, featuring impeccable editing and a wide variety of techniques, similar to Tykwer's Run Lola Run. But where Lola was specifically an exercise in narrative manipulation and form as message, this is a movie about an actual criminal that murdered people, making the flippant glitz come off as overwhelmingly immature and irresponsible.